Live Events Near You – We’re coming to you, click to find an event near you. In the “Music Theory” Category you will find Innovative Ideas and Massive Resources for Teaching Music Theory! In the “Teaching Tips” Category you will find Proven Systems to Enhance Your Teaching & Have Fun! In the “Sharing Ideas” Category you will find Creative Games and Inspiring Techniques for Successful Teaching! Interviews with Music Industry Professionals & UMT Certified Teachers. Watch their inspiring stories! Teach the UMT Supplemental Series – Video Sessions on how to simplify complex concepts from the RCM Syllabus in the UMT Supplemental Series. 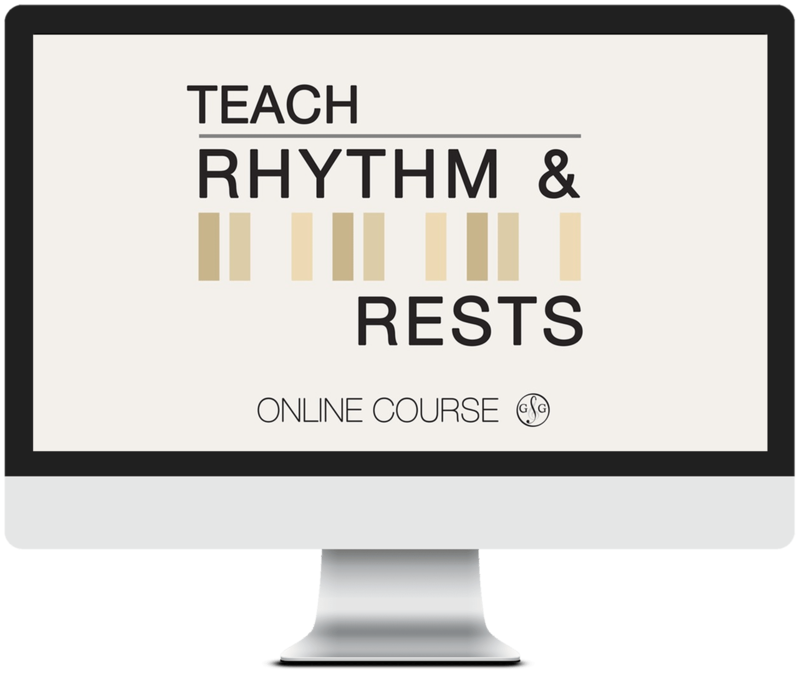 Teach Rhythm & Rests Course – Watch 8 Video Sessions plus get downloadable worksheets on Simple, Compound & Hybrid Time on Teaching Rests. Teach Intervals Online Course – Watch 6 Video Sessions plus get downloadable worksheets on the What, Where & Why Secrets for Teaching Intervals. Exclusive Teacher Training Course – Study: Learning Styles, 7 Keys to Creation, Connecting with Confidence, Marketing and How to Teach Music Theory. Teaching Success in Rhythm and Rests will help your students learn how rhythm determines the beat, pulse and duration of sound. Learn how and why rhythm is the most important element in music! Watch How You Can Easily Determine the Division of Rhythm & Rests in Any Time Signature! The Teach Rhythm and Rests Course includes 8 video sessions: two for each level of Preparatory (Prep 1 & Prep 2), Basic, Intermediate and Advanced Rudiments. Plus all your downloadable worksheets with examples and exercises for all 4 levels. In Simple Time each group is equal to a single (undotted) note. Rhythm (from the Greek word rhythmos) is a movement marked by a succession of the dynamics of strong and weak elements or musical sounds and silences. In Compound Time each group is equal to a single dotted note. Strong and weak beats are fundamental to the pulse of the rhythm. Rhythm is the length of sound or silence (long or short) that the beat creates. Groups of rests are written differently. In Hybrid Time each group is equal to a single (undotted) note or a dotted note. Rhythm in music may begin with an “upbeat” or a “downbeat”. Rhythm may be “on” the beat or “off” the beat. Understanding Beat vs. Pulse is the key to learning Rhythm & Rests. Teaching Success in Rhythm and Rests will help your students learn how rhythm determines the beat, pulse and duration of sound. The teacher training video sessions in the Teach Rhythm and Rests Course, will result in your teaching success, as your students will learn how and why rhythm is the most important element in music. Teach Rhythm and Rests Course – The Way to Score Success!